Color plays an important role in our lives from birth. Knowledge of the meaning of colors can help everyone become a master artist in the art of living. Although we constantly use color to both express and accent our lives, the nature and meaning of color remains one of the world’s greatest mysteries. 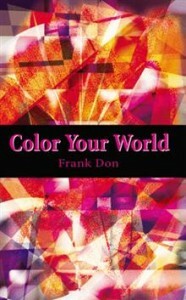 Frank Don is a color expert whose work is included in the Faber Birren Collection of Color housed at the Art and Architecture Library of Yale University in New Haven, Connecticut; and also in the collection at the Royal College of Art in London, England. What kind of earth changes must we expect? From Earth Changes Ahead: “The seers and scientists, we shall discover, are in agreement. The avenues along which the radical transformations of the earth are many. They include increasing frequencies of earthquakes and volcanoes. They include trends toward a global cooling spell arising from atmospheric paroxysms of adverse climate conditions. The higher incidence of earthquakes and volcanoes will shake us to the core. Changing weather patterns will make our very survival a constant struggle. …BUT WE MUST ACT NOW! The author of this landmark book on earth dynamics, Frank Don has accurately forecast volcanic eruptions and earthquake activity, and record-breaking precipitation seasons. Frank Don was commended for his work on earth dynamics on a program of the Los Angeles Federation of Scientists. 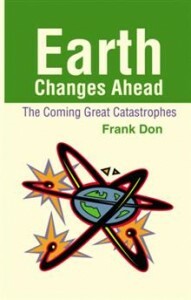 Earth Changes Ahead was recommended reading for a course on catastrophic geology at Drexel University in Philadelphia, Pennsylvania. THE MASTER SYSTEM: Getting to Know Yourself and Everyone Else provides a numerological mapping of self-discovery and a clear window into the personality traits and life journey of you and everyone else. 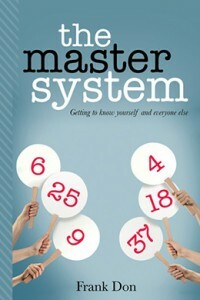 THE MASTER SYSTEM: Getting to Know Yourself and Everyone Else, is a unique tool and insightful system to learn more about yourself, different facets of your being and a comprehensive picture of who you truly are, and also to learn more about the characteristics of other people. By better understanding yourself, you can be more adept at successfully navigating your life’s journey. You can fully enjoy this life experience, for you are no longer bound to the conditioning of other people’s expectations of you. Frank Don is an executive coach and consultant who accesses the wisdom of the ages to shed light on the unique characteristics of the individual. His studies of energy systems have been expressed in his professional work and included in his seminal works on color and on earth phenomena. He is the author of COLOR YOUR WORLD, a study on the psychology of color and how the different frequencies of color affect us and reveals the significant colors in our own individual personal color rainbow. His work on color is included in the Faber Birren Collection of Color housed at the Art and Architecture Library of Yale University and at the Royal College of Art in London. He is the author of EARTH CHANGES AHEAD, a book that clearly explains and outlines the natural unfolding of climate changes and geophysical phenomena of earthquake and volcanic activity. Looking at the gestalt of earth dynamics, he discusses the earth changes ahead. 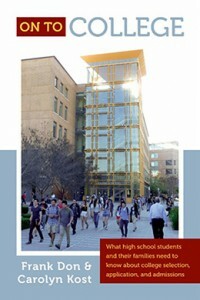 On to College: What high school students and their families need to know about college selection, application and admissions. A college education is likely to be one of the most important and expensive investments you will make in a lifetime, yet most students often lack the knowledge they need to choose and apply to the programs that will best suit their needs and interests. With many years of insider experience in college counseling and teaching, authors Kost and Don reveal for the first time proven strategies to be a savvy applicant, cut costs, and evaluate the hidden quality of a program—the single most important and neglected aspect of the process. Make your application essay stand out by using the authors’ proven strategies. Learn the secrets of fortifying your application without padding your resume. Use the tips and comprehensive timeline to stay focused, organized–and in front of college admissions officers. Follow the templates to effectively request letters of recommendation and compile an activities list and resume that will highlight your accomplishments. Understand the upcoming changes to the SAT and PSAT and why they are to your advantage. Get information about athletics directly from Division 1 coaches to be sure you have what they are looking for and be aware of the reasons to consider other ways of participating in sports. Find invaluable hints for artists of all kinds about auditions and portfolios and how to decide between specialized art schools and a more comprehensive university. Be inspired to consider attending universities in other countries from Canada to Israel and Australia to save money and time (3-year programs are more common) and acquire international experience. Truly a stand out among the college guides, On To College will be your indispensable go-to resource every step of the way. Carolyn Kost has been Vice President for Education/Chief Academic Officer for an independent secondary school and has been a College Counselor for an independent boarding and day school. She has served as a school board member and has taught in high schools and several universities. She has been a secondary school education consultant and is a partner in the educational consultancy practice East West College Counseling LLP. Carolyn Kost holds a B.A., an M.L.I.S., an M.Phil., and has satisfied all requirements for the Ph.D. except the dissertation. She has also earned Certificates in Secondary Education, Non-Profit Management, and College Counseling. Frank Don is an executive coach, personal development consultant and independent educational consultant with a thirty-year private practice. He is the author of several published books, and his published work is included in the Faber Birren Collection housed at Yale University. He is a partner in the educational consultancy practice East West College Counseling LLP. Frank Don holds a B.A. from the University of Pennsylvania, an M.B.A. from New York University, and Certificate in College Counseling from the University of California, Irvine.